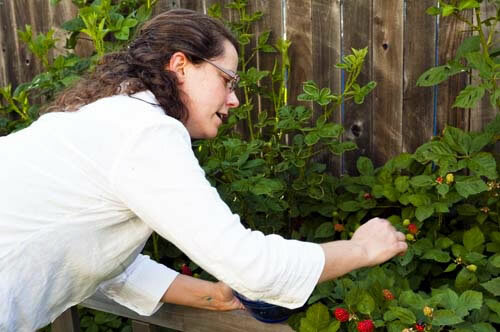 Lyn Bilodeau is a writer, consultant, and permaculturist living in Austin, Texas. Grapevines provide a bit of shade as the gardener stands on the porch and decides what’s for dinner. I can’t help but approach October: Unprocessed through my passion for organic gardens, edible landscapes, and permaculture. For those unfamiliar with the latter term, permaculture is the application of simple design principles which allow us to more easily care for people, care for the earth, and share the surplus. I believe the simplest way to eat more natural, unprocessed foods is to have them around — and the easiest way to have them around is to grow them ourselves, as close to the kitchen door as possible. With that in mind, here are a few suggestions for bringing your own organic produce to the table well beyond October. Redefine convenience and comfort foods. As a kid, I spent a summer with my sister in Iowa. Surrounded by cornfields, I ate corn raw off the cob. So simple, so good! In my grandfather’s garden, eating carrots fresh from the ground was a treat. Kids who hate vegetables have often never been in a garden; vegetables are yet another packaged thing they “should” eat — and don’t. But let them pick their own fruits, visit farm stands, or tend a garden and something magical happens — they build a lifetime relationship with real food, eating it with pride and pleasure. These childhood memories anchor me when I’m tired, hungry, and too busy to put much thought into dinner. A thriving garden becomes the ultimate in comfort food. I can end stressful days with a stroll through my backyard, picking vegetables for a garden-fresh salad or stir-fry. Along with a bit of cheese or steamed whole grains, I can put a quick, satisfying meal on the table with minimal effort. An intensively-planted four-foot square plot is more than enough to supplement the food needs of a small family, or feed a single adult. It’s also small enough to manage for most families. Mel Bartholomew’s approach of Square Foot Gardening provides a simple, easy to follow set of guidelines for gardening in four-foot square beds. Once you’ve got the hang of the technique, it’s easy to expand your garden one small bed at a time. What could be easier than a simple dessert of homegrown blackberries? Plant what you love to eat. This point may seem obvious, but home gardeners sometimes plant what they think they “should” eat instead of what they like to eat. 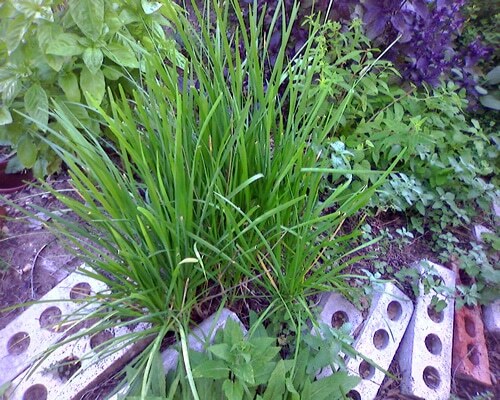 A small garden, intensively planted with vegetables and herbs you already enjoy, ensures that your efforts are rewarded. This is particularly true if you prefer heirloom or gourmet vegetables. Vegetables like asparagus and artichokes can be costly at the grocery store, but these perennial plants are easy to grow as part of an edible landscape, and will continue to produce for decades with minimal care. Keep the garden in plain view. 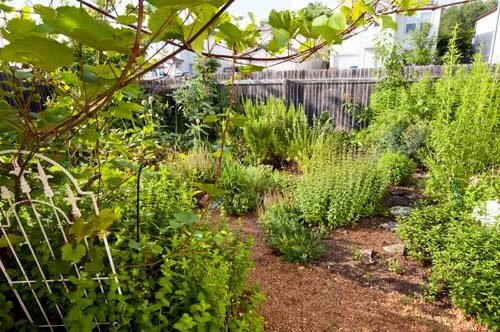 Permaculture’s integrated design principles suggest a series of zones for planting: herbs and frequently-harvested veggies planted closest to the kitchen door, production gardens and compost heaps slightly further out, and so on. If you can quickly dash out to snip a few fresh herbs or salad greens, you’re more likely to have them on your plate. If your garden is on the far side of your property, you probably won’t bother. This is another great reason to start with a small, intensively planted garden. When all those plants start producing, long rows may yield more than you can use. Planting a variety of vegetables in a small bed results in a usable yield. A simple spiral of herbs outside the kitchen door keeps a combination of culinary and tea herbs handy when you need them. If you have more than you need right away, employ easy strategies to avoid waste. Tomato glut? No need to can. Just freeze the extras in a freezer bag, and pop a defrosted tomato or two into stews, soups and sauces all winter long. Too much basil? A batch of homemade pesto frozen in an ice cube tray will yield summery tastes year-round. And don’t forget: vegetable trimmings make a great foundation for unprocessed soup stock. Feeling more ambitious? Add edible landscaping. Cordoned apple trees can help shade a sunny southern wall, while yielding a perfect fall lunchbox snack. Training grape vines or hardy kiwis up a pergola can create a shady spot to sit on summer evenings, not to mention a snack at your fingertips. These plants take a few years to bear fruit, but your future unprocessed-eating self will thank you! The best part of tending a garden? Having extra fruit, vegetables, seeds and plants to share with friends and neighbors. So set the table, invite your friends, and share the pleasure of home-grown, unprocessed meals year-round. I’ve been reading through your fantastic blog from post 1 and have really enjoyed the info, recipes, and tips you and your guest bloggers have posted. Any gardening tips for those of us who rent and do not have ANY land available? Hi Erika! Thanks for the kind words about my site. You could start by growing herbs indoors — most of them will do well on a windowsill that gets some direct sunlight. If you have a patio, tomatoes can do well in small pots, or even those upside-down hanging garden things.